So far, so good for the Colorado Rampage 15U AAA team in the first year USA Hockey has made the age level a national program. Coach Marc Boxer‘s club won only four of its first 10 games in the Tier 1 Elite Hockey League (T1EHL), but went 3-1 in a league showcase from Sept. 30-Oct. 3 in Troy, Mich.
“We’re starting to develop a team identity,” Boxer said. Andrew Sherman, Rampage board chairman, thinks he’s found the perfect coach for the team. Boxer has been coaching hockey for 20 years. His resume ranges from youth to college (Michigan Tech) to the pros (Memphis River Kings of the Central Hockey League). 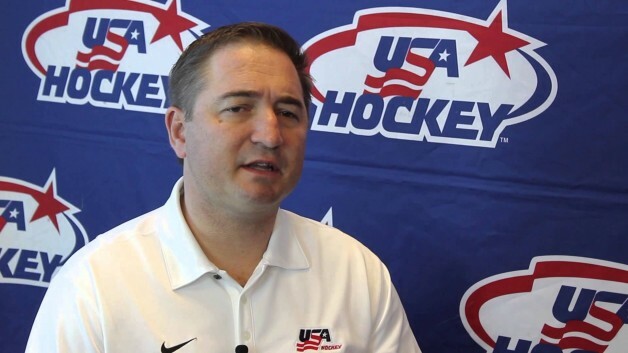 He’s been involved with USA Hockey national teams and player development since 2003 and has been director of junior hockey for USA Hockey since 2011. After a one-year hiatus from coaching to recharge, he said, he was given the opportunity to coach the new Rampage 15U AAA team and he jumped at the chance. A big draw was a chance to coach his son, Jack, who played for the Rampage 14U AAA team last year. Having a father coach his son is always an interesting dynamic. Boxer experienced it himself in the 1996-1997 season when his father, Herb, coached the River Kings. Boxer said his coaching philosophy doesn’t involve a lot of structure. He wants his players to learn to react to what’s happening on the ice. “It’s not good for a player to overthink things – it can cause stress and distractions,” he said. Coaching 15-year-olds offers unique challenges. At this age, players are transitioning from adolescence to becoming a young adult. Most of the players on the Rampage 15U AAA team are from Colorado. Others come from New Mexico, Utah and Wyoming. The roster also includes skaters McClain Beaudette, Miles Brenner, Nicholas Cimino, Quinn Connolly, Soren Cooley, Richard Flores, Keaton Foy, Alexander Gomez, Lucas Helland, Lachlan Henderson, Jake Jensen, Cadan LeValley, Ryan Malensek, Jayden Nieman, Carter Rapalje and Patrick Ryan and goalies Jackson Broussard and Evan Crawford. Boxer was born in Dallas, Tex., and began playing youth hockey in Hancock, Mich.
After playing for the Des Moines (Iowa) Buccaneers of the United States Hockey League (USHL) from 1989-91, he went on to a four-year career at Miami (Ohio) University and played professionally in the East Coast Hockey League and Central Hockey League and in Germany. He was an assistant coach with the River Kings from 1998-99 and at Michigan Tech from 1999-2001 before serving as manager of youth hockey at USA Hockey from 2003-10.